Third Coast Percussion performs with a cellist in Walla Walla. When he was an undergraduate student in the Bienen School of Music, David Skidmore (Bienen ’05) was the captain of the Northwestern University Drumline and a member of Boomshaka. 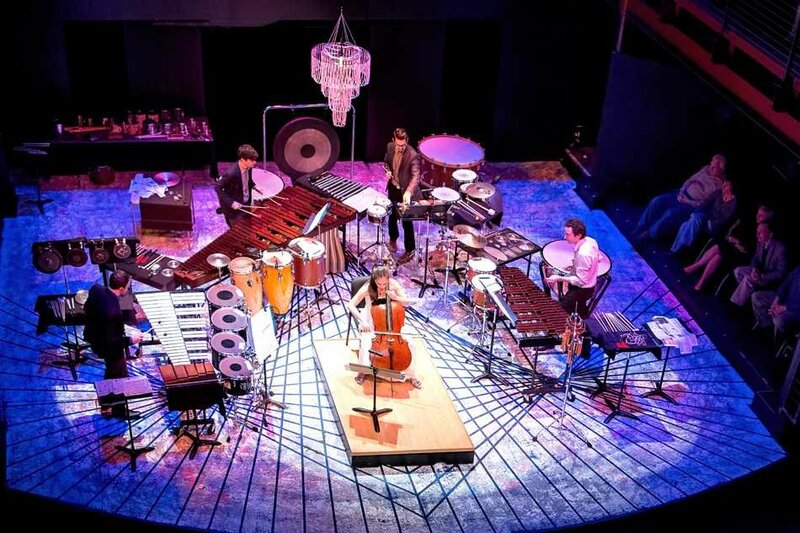 He now performs with three other Bienen graduates in Third Coast Percussion, an ensemble that collaborates with Chicago artists and composers and tours the world. One of Third Coast’s largest projects and collaborations, Skidmore said, has been their commission of “Resounding Earth” by Augusta Read Thomas (Bienen ’87). They met Read Thomas as students, when she taught at Bienen. Written for a percussion quartet, “Resounding Earth” was a new type of work for Read Thomas. The 35-minute piece is played on bells from all over the world, with four movements that pay homage to different composers. Read Thomas and Third Coast worked together in the ensemble’s studio to use new kinds of bells and improvise on the composer’s ideas. “Resounding Earth” premiered in 2012 with Third Coast’s first performance at the DeBartolo Performing Arts Center at the University of Notre Dame, where the quartet is now an ensemble-in-residence. On March 5, Third Coast performed the New York premiere of “Resounding Earth” at the Miller Theatre at Columbia University. The concert was also the premiere of Read Thomas’ new composition “Selene,” written for a percussion quartet and string quartet. Read Thomas said the members of the ensemble are “exceptional ambassadors” of the Chicago music community that values performing new work. Skidmore and the members of Third Coast enjoy the supportive and collaborative Chicago community of ensembles and musicians, some of whom are also fellow NU graduates. “Once we’ve sort of all left Northwestern, the relationships that we make there really carry over,” Skidmore said. The ensemble maintains connections with alumni and faculty and felt Chicago-based from the beginning because of its ties to NU. Skidmore also met Third Coast’s current board president in the NU Drumline.